Posted April 4th, 2019 & filed under News. 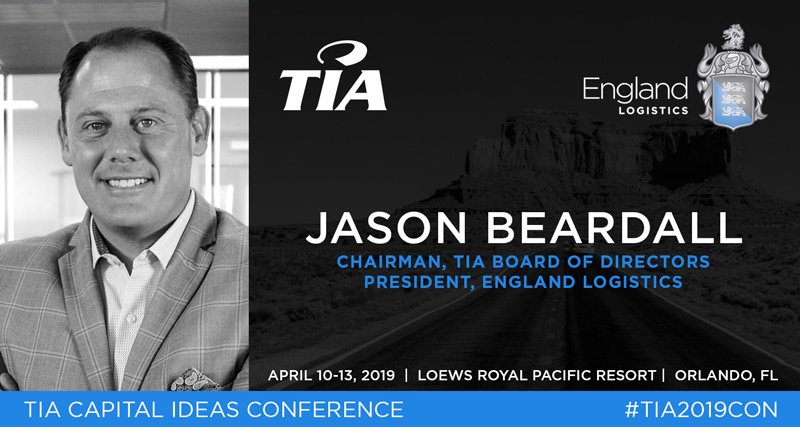 SALT LAKE CITY, Utah, April 4, 2019 – Jason Beardall, president of England Logistics and chairman of the board of directors for the Transportation Intermediaries Association (TIA), will open the TIA 2019 Capital Ideas Conference & Exhibition in Universal Orlando, FL April 10-13. This annual conference will consist of educational sessions on best practices and technology enhancements catered to brokerage-based logistics professionals. Beardall will present during three sessions throughout the conference. The first presentation titled “Building, Training & Retaining High Performance Teams” will take place from 2:00 – 3:30 p.m. on Thursday, April 11. Beardall will present alongside Bob Biesterfeld, COO at C.H. Robinson; Matt Meeks, vice president of strategic capacity and carrier experience at ArcBest; Michael Riccio, CMO at Leonard’s Express, Inc.; and Geoff Turner, president and CEO at Choptank Transport, Inc. Utilizing their experience as industry leaders, the presenters will offer tips for developing individuals and successful team cultures. TIA’s Annual Business Meeting & Opening Session on Friday, April 12 from 8:30 – 11:00 a.m. will also feature remarks from Beardall. He will be joined by Brian Evans, president and CEO at L&L Freight Services, Inc.; Jon Taffer, founder of Taffer Dynamics and executive producer for “Bar Rescue;” and Robert Voltmann, president and CEO of TIA. On the final day of the conference, Beardall will join Mike Crawford, president at ITS Logistics, and John Larkin, CFA, managing director of investment banking, transportation and logistics at Stifel Financial Corp., for a discussion on the future of the industry and the keys to success. This session titled “A Conversation with Leading CEOs” will take place on Saturday, April 13 from 8:00 – 8:45 a.m.